Buy Ruby’s Body Balm + (wax) by the 5-tin case. Perfect for teams, groups and gifts. 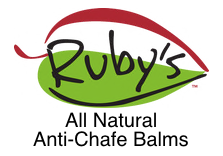 Ruby's Body Balm + contains the same 5 simple ALL NATURAL ingredients you have come to know and love. With a very thick consistency, Ruby’s Body Balm + will withstand the most rigorous exercises. Ruby’s Body Balm + comes in a handy 4 oz metal tin with screw lid for easy use and convenience while exercising.